The theme for this weekend appears to be accidental activism. Saturday’s show, from the Jewish Women’s Theatre (FB), was a collection of stories about people who became activists by having it thrust upon them. Last night’s show, Finks, at Rogue Machine Theatre (FB), had a very similar theme. All Mickey Dobbs wanted to do was entertain and be funny. He might make the occasional political joke in his nightclub act at Cafe Society, but his only political party was a party of one: the Mickey Dobbs party. Self-interest at its finest. After all, this was early 1950s, when the House Un-American Activities Committee was active, and anyone remotely connected with Hollywood or entertainment was being called up to testify. Having a political stance was dangerous — it could get one listed in the blacklist that wasn’t a blacklist, and there went your career. So apolitical he was; no public interest in politics. That was, however, until someone became interested in him. That someone was Natalie Meltzer, one of the co-founders of the Actors Faction within Actors Equity. She expressed her interest, however, by hiring him for Faction gigs, and as he got to know her — and other members of the faction such as Fred Lang and the homosexual co-founder, Bobby Gerard — he started to fall in love. He was never into the politics, but love makes strange bedfellows. In parallel, however, the committee continued to investigate. There were those who refused to testify, who were held in contempt of congress and imprisoned. There were those who were combative, and who lost their careers. And there were those, focused on saving their careers, who named names. And named names, And named names. Each person named was added to the suspicion list, and called in turn — and coerced to give more names. Eventually, the HUAC’s attention turned to the faction. Who would fight back? Who would name names? And when the spotlight hit Mickey, would he be that accidental activist, or would he save his career? That, in essence, is the plotline of Finks, written by Joe Gilford, son of the actor Jack Gilford, one of the actors blacklisted during this period. If you read Jack Gilford’s story, it isn’t hard to see that Mickey Dobbs isn’t that far from Jack Gilford. Worked at Cafe Society. Married a woman he met at progressive political meetings and events during the late 1940s, and entertained at many of these events, some of them produced by his wife. She was married at the time and divorced her first husband soon after meeting Gilford. In 1953 Gilford and his wife were called to testify before the HUAC regarding their alleged Communist sympathies, after being specifically named by choreographer Jerome Robbins (the character Bobby Gerard in the play) in his own testimony to the committee. I should note that this play is running in repertory with Oppenheimer, which tells the story of J. Robert Oppenheimer. Oppenheimer, too, had his run-ins with the HUAC hysteria for his tangential connection to the Communist party early in his career. So why Finks? Why now? In fact, why is the notion of accidental activism so resonant these days? For the answer, you need to look no further than 1600 Pennsylvania Avenue (and I don’t mean the failed musical) and the current occupant’s habit of using heresay and innuendo to attempt to ruin careers of people that he doesn’t like. You need to look no further at a society that used to be overly concerned about “the Red Menace” (Russia) taking over our society becoming one that is now turning a blind eye to Russia interfering in our elections. One wonders what the folks of the HUAC would make of Trump. The pendulum swings, but perhaps it has swung way too far. But more importantly, there is the accidental activism that has been the result, as demonstrated this November. We have candidates of color and gender that are toppling the entrenched white male leadership — activism that was catalyzed in response to the election of Trump. Plays like Finks demonstrate the power of theatre to remind us of what is important. They show us that the best way to fight back against a government that has taken a wrong turn — in either direction — is to become that activist. They show us the power of standing up for what is right, even at a great personal costs. That’s true for the actors of the Hollywood Blacklist, most of whom were not Communists in the Russian sense, but working for peace and better conditions for workers in all industries. That’s equally true for the Democrats of today, who are working to make the country better for all. This play sends the message of the importance of standing up (or of kneeling, when appropriate) to authority that isn’t upholding the values of America. Under the direction of Michael Pressman, this cast is supurb, lead by the real life husband and wife team of French Stewart and Vanessa Stewart. These two are familiar with activism, both being very active in the I Love 99 movement here in Los Angeles, working for the rights of actors to volunteer their time in the intimate theatres of Los Angeles. Watching them on the RMF stage, one gets the feeling of this passion within them (and their real passion for each other, which comes through in the comfortable interaction of their characters). Both are strong, strong actors and just a delight to watch as they really become their characters. In supporting roles on the Actors Faction side are Adam Lebowitz-Lockard as Bobby Gerard and Bruce Nozick as Fred Lang. Both have strong characterizations of their characters. I particularly liked Lebowitz-Lockard in the first scenes where we meet him and his later testimony; Nozick is really strong in his testimony and his prison scene. Lockshening away on the piano was Richard Levinson as Dickie Lewis, the Piano Man. Levinson is always a delight to hear on the piano. On the HUAC side of the equation was Matt Gottlieb as Rep. Walter; Stephen Tyler Howell as the Sgt. at Arms (as well as the Bartender, Announcer, and Leading Man); Daniel Dorr as Victor Lynch, Stanley, and Elia Kazan; and Thomas Fiscella as Martin Berkeley, Carl Brody, Budd Schulberg, Lee J. Cobb, and Phil Larsen. All were strong. I particularly liked the exasperation of Gottlieb’s congresscritter, and the adaptability of Fiscella and Dorr’s characterizations. The scenic design was by Stephanie Kerley Schwartz, who had to make do with the basic set structure from Oppenheimer (which was presented in the same space just a few hours earlier). As such, the space was defined mostly by props and set pieces: a piano, bar tables, a couch, a hearing table with microphones. There were some cameras and radios hanging in the back that seemed to serve no purpose. Also establishing the sense of place was Nicholas E. Santiago‘s projections — especially for the scenes as Cafe Society. Halei Parker‘s costume design was excellent. Other than a few failing sleeve hems, the costumes were appropriately period (including the high waisted look and the maternity outfits) and the actors carried them off well. Christopher Moscatiello‘s sound design and Matt Richter‘s lighting design did what good designs of that ilk do: they faded into the background establishing time and environment without intruding. Rounding out the technical and production credits: Cecilia Fairchild [Asst. Director]; Ramón Valdez [Stage Manager]; Victoria Hoffman [Casting Director]; Amanda Bierbauer [Production Manager]; David Mauer [Technical Director]; Elina de Santos [Co-Artistic Director]; John Perrin Flynn [Producer, Artistic Director]. 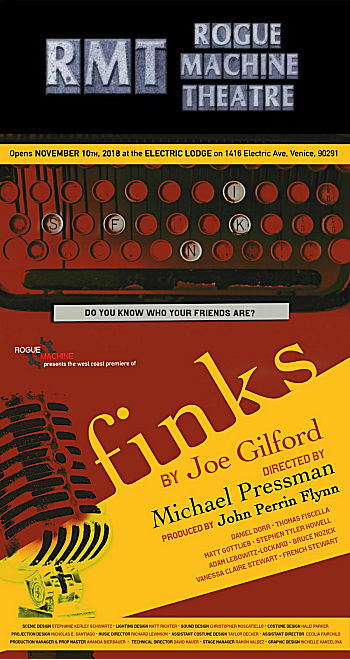 Finks continues at Rogue Machine Theatre (FB) through December 30. Tickets are available online through the RMT website. It is a production well worth seeing in this day and age, reminding us of the value of standing up for what you believe in. Thanksgiving weekend brings Steambath at the Odyssey Theatre Ensemble (FB) on Saturday and Remembering Boyle Heights at Casa 0101 (FB) in Boyle Heights on Sunday. December starts with the Annual Computer Security Applications Conference (ACSAC). It will also bring Come From Away at the Ahmanson Theatre (FB). Other than that, December is open while we recover (other than the obligatory movie on Christmas Day — our one day a year for filmed entertainment).